Ecommerce, perhaps more than any other industry, is deeply affected by digital marketing trends. The shifts are bigger and come more often than for other digital properties. Too often this is seen as a disadvantage. But digital marketers that are trend-aware and future-thinking, recognize this as an opportunity. Although trends may come fast, they are generally possible to predict. At least for the ecommerce marketing pros. Awareness of upcoming trends lets you get an edge up on your competitors. The best ecommerce marketers use in-depth knowledge of your product, your clients, and your industry to build unstoppable campaigns. We combine these core values with a unique understanding of search marketing. Our founders are former Googlers, so we have insights into the past and future workings of search engines. These kinds of deep insights help us paint a bigger picture of ecommerce marketing that no other company can match. We also utilize the right tools to help your business stand out in the competitive e-commerce field. These tools help us to build unstoppable PPC & SEO campaigns for leading e-commerce brands. Get started with a complimentary marketing assessment today, or read on for more information. Ecommerce success starts with planning. An ecommerce search marketing plan is your playbook for profitability online. The planning stage is the most intensive. Creating a strong foundation with the right objectives and KPIs is essential for a sound digital strategy. The following are a few of the techniques we use to create unbeatable PPC & SEO strategies for ecommerce. Ecommerce marketing success relies heavily on understanding the business and its goals. It also requires in-depth knowledge of the customer. Their demographics, psychographics, and what stage of the consumer journey they are in. For a new ecommerce business, the ideal customer may not yet be known. In this case, a wider net can be cast which will be refined through the analytics and optimization stages. This technique will measure and test new data continually. Ultimately, narrowing down and targeting your ideal customer. SWOT analysis is a deep dive into your strengths, weaknesses, opportunities, and threats. It involves multiple factors including a website audit, competitor analysis, keyword research, and industry trends. The website audit identifies strengths and weaknesses on your site. It will uncover both what you are doing well and what can be improved on. Even more important, it uncovers problems your site may be having. These problems can result in search engine penalization, keeping customers from finding your site. A website audit identifies and builds a plan to fix these problems. By using specialized search marketing tools, we can uncover competitor insights and strategies. These insights show what is working for your competitors that can be emulated. As well as what isn’t working and should be avoided or tweaked. It can also identify opportunities your competitors are not taking advantage of. This can be a great way to expose and harvest a niche in your market. Some of the most valuable information gained from competitor analysis is keyword data. Keyword research is the true core of PPC and SEO planning. It defines the content, targeting, ads, and optimization that will be performed. The Pedestal search engine marketing team uses exclusive proprietary tools to discover the most profitable and actionable keywords for your business. Delving into relevant trends can uncover some of the biggest opportunities and threats. Being early to discover and adapt to trends makes it possible to get a leg up on the competition. It also keeps you from getting left behind. An example could be in geographical targeting. 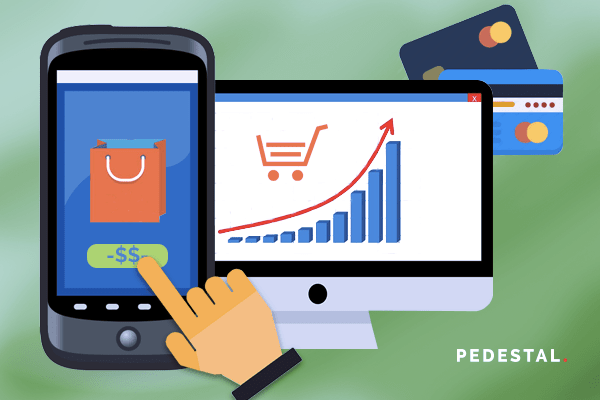 For years, the US has been the driving force behind ecommerce. Year after year, we saw 10% increases in ecommerce spending in the US alone. Soon, however, this is projected to plateau. While America will still be a valuable ecom market, it is no longer the industry juggernaut. China is rapidly overtaking the USA in ecommerce spending, with a projected $1 trillion increase in spending in just 2 years! Ecommerce brands that are equipped to sell to China, have massive opportunity marketing to China’s online shopping boom. Identifying trends like this can open up new revenue streams, and change the face of your business. It also begs the question, where will be next? India, the world’s second-most-populous nation, has been adapting to more Western-style consumerism. At the same time, their internet access and speeds are continuing to improve. Will India be the next ecommerce boom? If so, you need to work with a marketer who can catch it early. A successful digital marketing campaign relies on setting reasonable and measurable objectives and KPIs. The planning elements we have addressed above all serve to inform objectives & key performance indicators. A good strategy will have short-term goals, mid-length, long-term, and ongoing goals. With the initial planning complete, your ecommerce search marketing strategy can be put into place. As data begins to collect, the analytics stage begins. Check back soon for Unstoppable Ecommerce Search Marketing Strategy Part 2 where we delve into analytics & optimization.